“A Star is Born” is a remake of the 1976 film of the same name. That film was a remake of a 1937 film. It was also turned into a musical by the same name in 1954. The 2018 modern revamp of the story was directed by Bradley Cooper and starred Cooper and Lady Gaga. Lady Gaga plays Ally, a waitress by day and drag bar performer by night. She has given up on her dream of being a singer and songwriter. Her life is changed when Jackson Maine, played by Cooper, drunkenly stumbles into the bar Ally is performing in. The famous singer is captivated by Ally’s performance and meets her in the dressing room later. He sees promise in her talent and brings her on tour with him, catapulting her career and their whirlwind romantic relationship. Substance abuse creates many problems for the couple – as does Ally’s career surpassing Jack’s. The music is what made this romantic drama something unique and artistic. All songs were performed live. The soundtrack is No. 1 on the Billboard top 200 album chart. Cooper, commonly known for his acting performances in “Silver Linings Playbook” and “American Sniper,” was new to the vocal scene but pulled off the debut seamlessly. Both his and Gaga’s vocals were powerfully emotional and authentic. I have listened to the soundtrack on repeat since seeing the film, and the artistry of the lyrics and music continues to impress me. Sound effects throughout the film helped to draw the viewer into the story. Jack suffers from tinnitus – which is represented with a background ringing that continuously gets louder. This, in combination with a roaring crowd and heavy bass beats, makes moviegoers feel as though they are the ones performing in concert. The hazy lighting at the beginning of the film clears away to vivid, colorful scenes at the end, creating a mood fitting to Ally’s rise to stardom. The scenes were artfully shot, making use of close-ups to highlight the emotions of the actors. Often times, the camera would focus in on an actor’s face but the background would be what truly told the story. I appreciated the subtlety of this technique. I did not appreciate the lack of subtlety when it came to foreshadowing. I found the plot to be predictable due to this obvious foreshadowing, and I was able to guess the ending long before it happened. The impracticality of Ally’s rapid rise to fame was unbelievable and idealistic. Nevertheless, Gaga was a star in the portrayal of this role and gave a vulnerable and relatable performance. 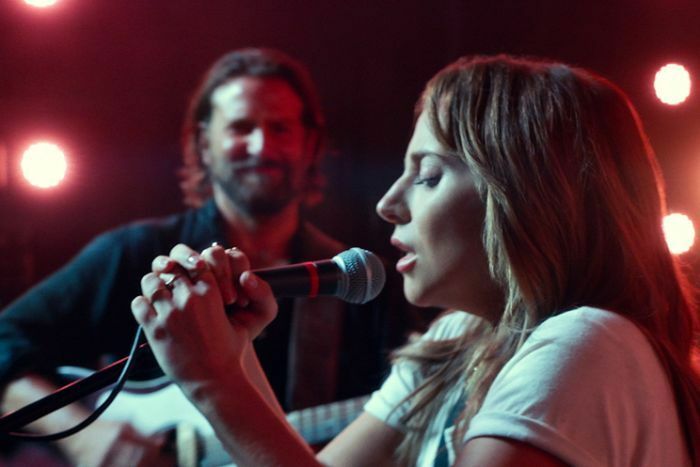 Gaga took the screen with a fresh-faced and natural look, accenting the raw, vulnerable power of her voice. The talent she possesses is undeniable. Her versatility as a singer allowed her to transition from powerful pop beats to country duets with Cooper. Her character was real and dynamic as she shifted from a waitress attempting to fade into the background to a made-up, dressed-up pop star. Gaga’s performance was believable and impressive. While I was at first skeptical of Cooper’s capabilities in handling the demanding role of Jackson Maine, I wholeheartedly support his portrayal of the role. He brought a grit to the screen and was able to pull of the archetype of troubled artist expertly. He brought a sweaty, scraggly, earnest guy who has been tarnished by alcohol, drugs and a messed up childhood to life. His raspy voice and guitar playing skills managed to portray the country-rock vibe necessary to pull off the challenging soundtrack. The movie dealt with important issues that trouble the music industry of today. Ally struggled to make it in the industry because many producers felt that her nose was too big and that she wasn’t pretty enough to be successful. Women who wish to be performers are often held to unattainable beauty standards and are judged based on their appearance – not the art itself. The movie highlighted the outrageousness of this standard. Jack feels that Ally is losing her artistry as she heeds her producer’s advice and adds more theatrics to her performance. The line between creating music for the consumer and creating music as an act of self-expression is a thin one that many musicians find challenging not to cross. Ally’s music and lyrics change drastically as she gains popularity and begins to take the public’s opinions into account. She even dyes her hair and starts to wear clothing that does not fit her own personal style. At one point she has a photo shoot and comments on how the pictures no longer look like her. The industry has caused her to compromise her identity. This film played into the clichés of chasing dreams and star-quality talent being in every person – ideas that I found to induce major eye rolls. The plot was unrealistic and predictable. Despite these flaws, a majority of the theater left the movie with tear filled eyes and new tunes to add to their Spotify playlists. I would recommend this movie on the basis of the crowd-pleasing soundtrack, artistic filmography and outstanding acting performances.